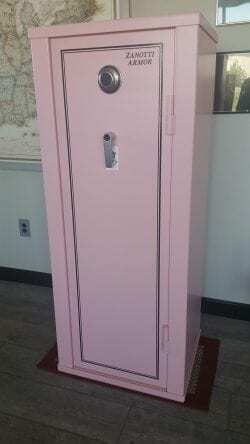 When Mark Zanotti would call his customers to tell them their new safe was ready he liked to joke and tell them it was a “beautiful shade of PINK just like you ordered.” Well it’s no longer a joke. 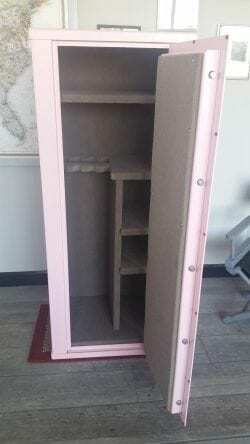 Today we manufactured our first PINK safe and, in keeping with the tradition Mark started 30 years ago of supporting our military, we will be auctioning off this one-of-a-kind safe, valued at $2000, with 100% of the proceeds going to female military personnel dealing with breast cancer and in need of assistance. We are partnering with the ABCF (@AmericanBreastCancerFoundation) on this project so PLEASE consider “sharing” this post as we try to get as much exposure as possible so, in turn, we can raise as much money as possible for this cause. To bid on this item click the link below.